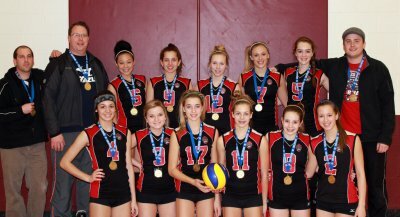 On March 24, 2012, at the Bugarski Cup held in Ottawa, the 15U girls black team finished their regular season tournament with a Gold Medal, Championship level. What a day, from start to finish, the girls showed their potential and were determined to win. What a great way to head into the 15U Provincials, April 13-15, 2012. Good luck and congratulations again to the team and their coaches! 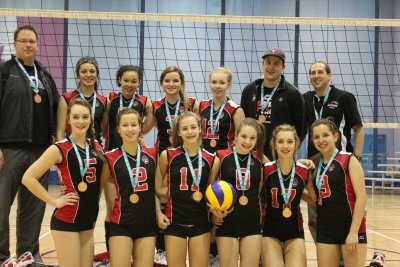 15U Girls Black team bring home a Bronze medal this time at the 15U McGregor Cup held in Kingston on Feb. 25, 2012. Thanks again to the wonderful coaches, Rob Piccione, Troy Neill and Jeff Simmonds for all your support. We all had a great time staying over night in a hotel for the first time this season. 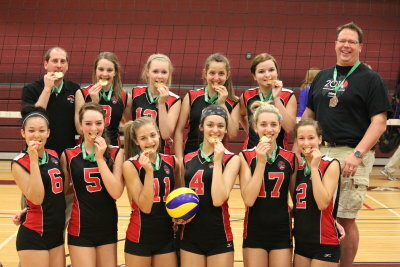 15U Girls Black team does it again, they won another Gold medal at a 15U Tournament on January 14, 2012 in Stouffville. Congratulations to Jaelyn Jarrett, Sophia Nikoloulias, Madison Neill, Hannah Smith, Tristen Tamblyn, Jalisa Sterling-Flemmings, Chloe Michaud, Braedyn Tutton, Lexie Prinzen, Amanda Mulholland, Kelsey Harris and their Coaches, Rob Piccione, Troy Neill and Jeff Simmonds. Congratulations to 15U Black for a great tournament!